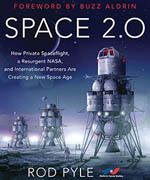 The National Space Society (NSS) is an independent, educational, grassroots, non-profit organization dedicated to the creation of a spacefaring civilization. Founded as the National Space Institute (1974) and L5 Society (1975), which merged to form NSS in 1987 (see merger proclamation), NSS is widely acknowledged as the preeminent citizen’s voice on space. NSS has over 50 chapters in the United States and around the world. 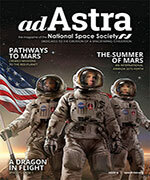 The society also publishes Ad Astra magazine, an award-winning periodical chronicling the most important developments in space. For more details on what NSS stands for, visit our Statement of Philosophy page or download a PDF version. NSS leadership is provided by a member-elected, all-volunteer Board of Directors that provides strategic direction for the Society, and a Board-elected Executive Committee (Officers) that manages the functions of the Society and oversees a number of supporting operating committees. The day-to-day operations of the society are managed by a Headquarters Staff led by the NSS Executive Director, with the assistance of operating committees, chapters, and other volunteers. Local volunteer work is generally performed through chapters: check our chapters listings to find a chapter near you, or organize a new U.S. chapter or starting a new international chapter.